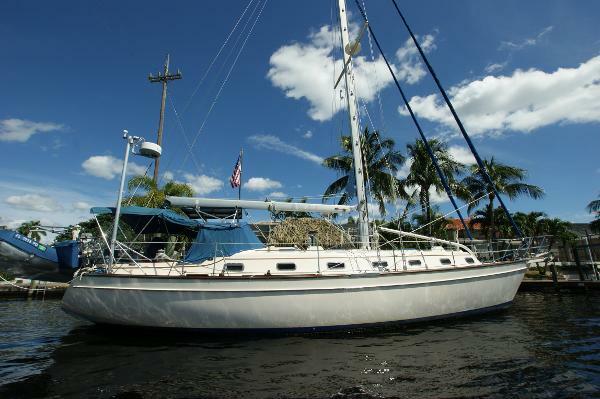 2002 Island Packet 420 New listing on a fully blue water ready IP. One owner boat that has been very well maintained and outfitted. 270 watt solar panels, 5.5 kw gen set, 2000 watt inverter, fuel polisher. Kato davits with stabilizers and 6:1 lift. Fully chapped hard bottom 12' (11'8") tender with Tohatsu 9.9 4 stroke. Exterior teak has a full set of cover. Freshly waxed and detailed. Boat has a 3/4 set of boat covers that runs the entire forward of the deck. It is very well protected from the sun. All bright work is newly finished and in excellent condition. Modern Garmin 4212's at nav station and helm. New main sail, new UV sun covers on head sails. Tons of extras and improvements. If you are in the market for the iconic and much sought after 42 Island Packet "Mystic Sea" is sure to impress.